I was so excited when I found out I was pregnant, I have wanted to be a mom for as long as I can remember. I have always wanted to have a water birth at home, I can’t think of a better place to experience such a miracle than in your own home. 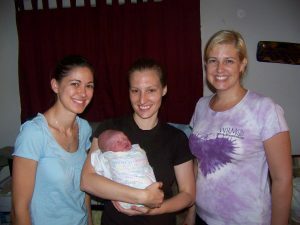 Soon after we found out about our pregnancy, I started researching homebirth and looking for a midwife. Baby’s 1st Day was the first webpage I looked at and I felt an instant connection with April just reading what she had to say about her philosophy on birth and the power of women. Jeremy and I went and met with April and we knew she was who we wanted to deliver our child! She has the same sense of humor as I do and being able to laugh and talk together was very important to me. We started seeing April very early on in our pregnancy and from day one, I felt great. I actually felt so great, that for a while I kept taking pregnancy tests to be sure I was pregnant! We reached the last month of our pregnancy so quickly, I couldn’t believe how fast it went! On August 4th we were scheduled for our 37 week appointment. I called April that morning because I noticed a significant decrease in activity. The baby was usually so busy and that day was unusually quiet. She said to pay close attention and if I still felt worried she would do a non-stress check at our appointment that night. Quinn Thomas VanHorn was born at 4:07am on August 5, 2009. We didn’t know what we were having and it took us a couple of minutes to remember to look, because we were just so excited the baby had arrived! He was a beautiful 7lbs 12ozs and was 20.5 inches long. He went right to my chest and stayed there for the next 45 minutes or so. My placenta decided to deliver quickly too, and Jeremy cut Quinn’s cord. April had to give me some herbs to slow down the bleeding, but I never felt concerned or worried at all. The whole process took about 8 hours, but it flew by for me. I used hypnobirthing and felt like I was in a whole other place through my whole labor. I feel blessed to have had my son at home, surrounded by my husband and wonderful, strong, supportive women. Giving birth was the most empowering experience I have ever had – I am a fierce momma! The only thing I will do differently with our next pregnancy is set up that tub much earlier!